The hanging pawns structure is a very common one in the chess game. By definition, we call hanging pawns when there are two pawns joint together but isolated from the rest of the pawn chain. 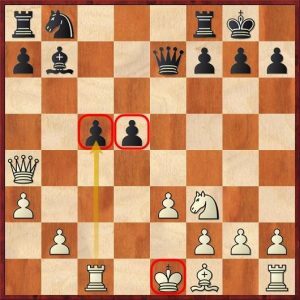 They are usually on the fourth rank; if found already beyond they are no longer hanging, but two very dangerous passed pawns! Just like the Isolated Queens Pawn structure, the hanging pawns have a similar character. They can be very strong or they can be a target for the opponent. It all depends on the dynamic factors of the position. One small difference between hanging pawns and IQP structure is that with the hanging pawns you control more squares. However, in both structures, one should seek to break through the advance of one these pawns. The hanging pawns often arise from openings like Sicilian Alapin variation, Nimzo Indian, Queens Gambit, Queens Indian, and many other variations from queen’s pawn openings. 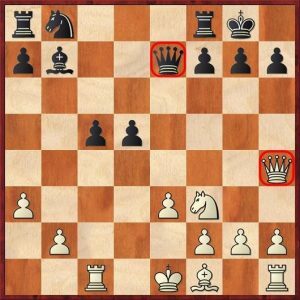 If advancing one of the pawns is not possible, then we want to keep them together in order to not concede important central squares. In general, one should aim for dynamic – active play. When you are playing against the hanging pawns one should try to do exactly the opposite of what is written in the list above. Aim for static play and cut any hopes of active play for your opponent. The position in the diagram above arose after 13 moves from a Queen’s Indian Defense. Both sides have clear plans. White wants to put pressure on black’s pawns in order to capture them or at the very least force black to stand passively defending them. On the other hand, black would like to finish his development and then think about active play along with the open files and maybe, in the future an advance with d5-d4. One can see how different both strategies are; while white has a strategic quiet plan, black has ideas that are more active. Static vs Dynamics. 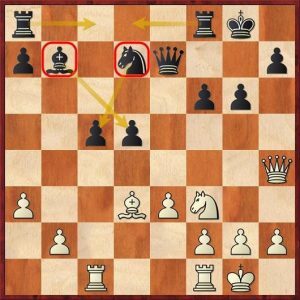 An excellent move that disrupts black’s plans of activity. Without queens, the black position would become more passive and white will easily direct the attack against the black pawns. Black had to reply with 14…f6. A move that weakens black’s position and is not desirable to play. 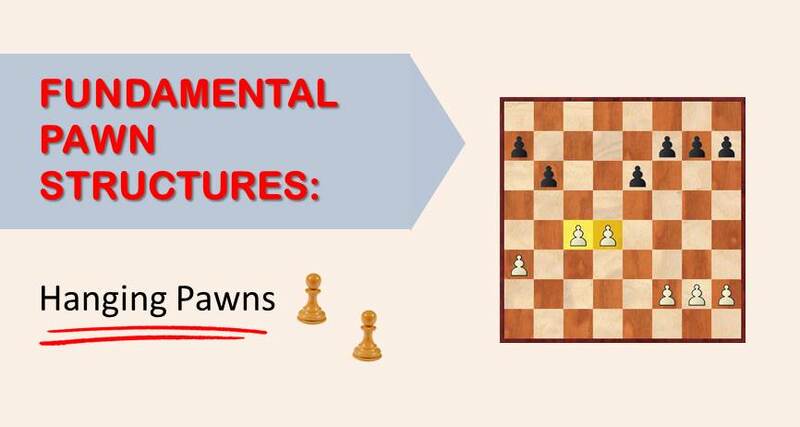 This is our third diagram to understand the nature of playing against the hanging pawns structure. Although white hit first and managed to finish development quickly, black is catching up. His pieces are set in the right squares and now he wants Rac8 and Rfd8 with a perfectly fine position. How should white play now? 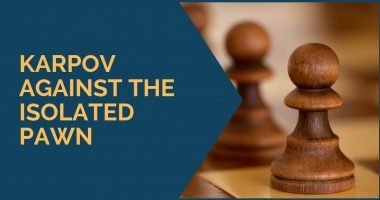 In point number 4 of the list given at the start of this article, we mention that keeping the pawns together is one of the main tasks for the side with hanging pawns. This is simple to understand, while the pawns are together they control squares and are strong if one of them advances or disappears the remaining pawn becomes weak. With this in mind, Karpov continued with the move 17.Rfe1! With the idea of e3-e4 splitting black’s pawns or minimum gaining the c4 square if the d5 pawn is forced to advance. Black cannot keep the pawns together much longer and continued with c5-c4, which allowed white to play against the backward (left behind) d5 pawn. 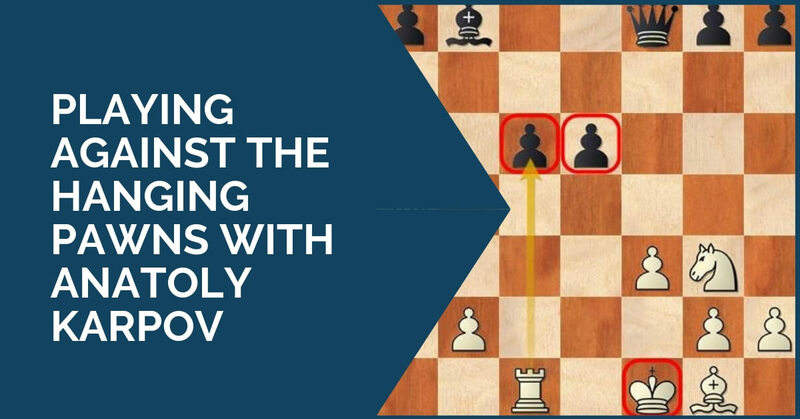 We hope you have enjoyed this masterclass by Anatoly Karpov and learned the main strategies to have in mind when playing with or against the hanging pawns structure. Find this post useful? Share it? 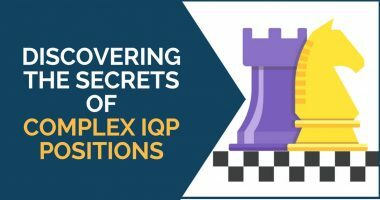 Join more than 15,000 subscribers and get access FREE Chess Study Guide!